Over the years I have developed a daily routine that allows me to be extremely productive, while not becoming overwhelmed. We all have a limited amount of time each day and if you want to accomplish your goals then you will need to have a system. If you do not create a plan for your day, then the world will create one for you. I have pulled together a few strategies that I have learned from productivity experts to create a routine that works for me. Feel free to grab some of these strategies for your daily routine. I found that this is definitely one area that requires trial and error. This is challenging for me because I will receive emails throughout my day that will cause me to switch tasks and respond. Switching tasks decreases productivity since creative work requires you to enter a flow. Note: Most of the tasks in our day are split up between creating and responding. When I say responding, I am talking about email, phone calls etc. You are not creating any new work or adding value, you are simply answering others questions and completing other peoples tasks. It is important to respond in a timely manner but responding should not be more important than creating work that will add value. I also have another section on my daily list for “Extra Tasks.” These are small additional items that I need to accomplish throughout the day that require less time and are not as important. If I do not get to all of them, then some minor issues might come up. It is important to not allow the fear of minor problems occurring to prevent you from working on your major tasks. Problems happen everyday. You need to live with the little ones to stay focused on the most important tasks. Some examples of these would be to return a phone call, send an email, contact a potential media outlet for Thirst Apparel, etc. These tasks may move up to become critical tasks as they move closer to a deadline, but until then they do not take precedence over the critical tasks. I use Evernote to stay organized and fill this out every night. I keep it as simple as possible by design. This idea came from the personal development author, Brian Tracy. He is the top selling author of 70 books and released more than 400 audio and video learning programs. He has essentially released a new product every month for the last 30 years and understands how to be productive. He explains that if you were to eat a frog, you wouldn’t wait around and look at it for awhile, you would simply swallow it as quickly as possible to get it over with. The more you think about it, the worse it becomes. This is a very strange way of saying that you should take that one task for the day that you are dreading the most and finish it first. I try and make this my first critical task on the list. It is almost always something that I don’t want to do but needs to be done. I then make sure to finish that task before checking email or doing any response work. It is an amazing feeling when you accomplish that difficult first thing in the day. You have a boost of energy for the rest of the day. It is no longer sitting in the back of your mind as you do a thousand other minor tasks to look busy and put it off. The rest of the day seems downhill. Your energy level increases and you are far more productive for the rest of your day. This is still a challenge for me and I have not quite made it a habit yet. However, on the days that I do take this approach, I tend to accomplish almost twice as much (no exaggeration). Procrastination runs your day when you do not swallow the frog first. Studies have found that you can focus on a task for approximately 90 minutes. Your body also goes through its sleeping cycle or circadian rhythm every 90 to 120 minutes. Research shows that this is also the maximum amount of time that you should work on a task without an extended break. Therefore, when I sit down to work on one of my three critical tasks, I start a timer for 45 minutes. When that 45 minutes is up, I take a 3 to 5 minute break where I walk around or get some water. This is not a time to check email and engage your brain in a different activity. This is a quick break to allow your mind to rest. When that 5 minutes is up I restart the timer for another 45 minutes. At the end of this second section I take an extended break for about 15 minutes. Sometimes I will do some pushups or pullups during this extended break. I also schedule my lunch after one of these 90 minute cycles. I have found that this allows me to really get into a task and get some rhythm. If I try and work for less time, I don’t feel like I can get into a flow. If I work for more time then I feel tired and I can notice that my productivity is dropping off. This works for me but there are some other strategies out there. Try out different time intervals for you and see what works best. 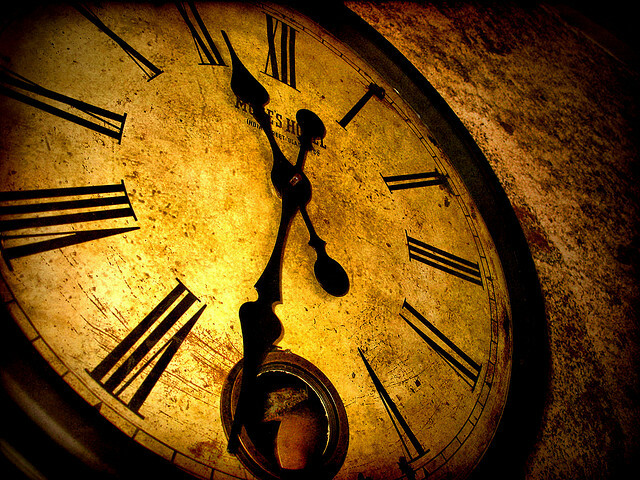 It is far easier to get started on a task when you have a clearly defined end time. Starting is the hardest part and working in cycles helps to ease the pain. I need a way to hold myself accountable or I won’t get things done. I am pretty competitive by nature, so I like to get a score on things. 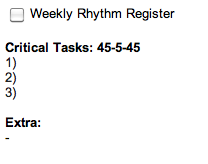 One way to do that is with a weekly rhythm register. This is a concept that I was introduced to by Darren Hardy who is the Editor and Chief of Success Magazine. It is essentially a simple graph that allows you to track how many times you accomplished a certain task each week. As you can see, you set a goal for the number of times you will accomplish a task each week. Your goal should be to land right at the 0 mark. If you are scoring just below then you are probably in a good spot and challenging yourself. If you are scoring above, then you might need to challenge yourself more. The other option if you are scoring above your goal is that you are working too much. Life is all about balance and if you are way above your weekly tasks then you might be working to much and neglecting other important areas like family, friends or rest. That is something you will need to gauge. Make sure that you are stretching yourself in a balanced way and not avoiding certain aspects of your life. Please feel free to leave a comment with other techniques or tips that have helped you to be more productive. Great stuff .. 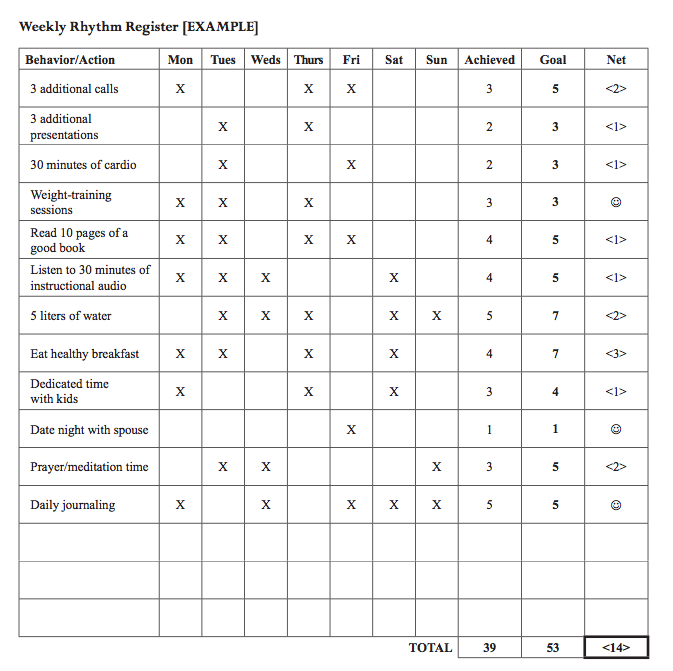 I was loking to start using this weekly rhythm register that I saw in the Success magazine .. and now I will because of this blog.